It's february and Lisa of Parsley, Sage, Desserts and Line Drives asked us to bake Bread with Chocolate for BBD#47. The first thing that came to my mind was a dark brown moist chocolate pile with walnuts. But, even though I found a delicious recipe already, and I will bake this one day, it looks more like cake to me. And I promised Peter not to bake too much sweet delicious treats to help him loose some weight, I had to look for something more healthier. What's more healthier than bread with rye, nuts, berries and a bit of chocolate? Norwich Sourdough with walnuts, cranberries and off course chocolate. We didn't have much bread left in our freezer. I decided to bake two loaves of Norwich Sourdough, one regular and one with chocolate, cranberries and walnut. When I baked the Chocolate, Cranberries and Walnut Loaf the kitchen began to smell like a candy store or an ice cream shop. The chocolate melted and gave the loaf darker spots on the crust. Of course we had to taste a slice and we loved it. It's a ready to eat bread. One slice has it all; sweetness of chocolate, tangy of the cranberries and a nutty taste of the walnut. And all in a delicious Norwich Sourdough! Today,14 february, is Valentine's day. A day for lovers and also a day for friends. I baked this Chocolate, Cranberries and Walnut Norwich Sourdough as a Valentine for the followers of my blog. Let the dough rest (autolyse) for 30 minutes. Add the salt and continue mixing on low or medium speed until the dough reaches a medium level of gluten development. This took me about 2 or 3 minutes. Place the dough on the work counter and knead the chocolate, cranberries and walnuts in by hand. When the pieces stay on the outside, just push them in the dough. Transfer the dough to a slightly oiled container. Let ferment at room temperature (22-25 C) for 2.5 hours, with folds at 50 and 100 minutes. Turn the dough out onto a lightly floured counter. Pre-shape the dough pieces into light balls. Shape into a boulle and place seam-side-up in a floured banneton.Slip the banneton into a large plastic bag and proof at room temperature for 2 – 2,5 hours. Or proof for 1.5 hours at room temperature, then refrigerated for 2 – 16 hours and baked directly out of the refrigerator; this will yield a tangier bread with a lovely, blistered crust. I choose to place the loaf in the refrigerator over night. The next morning I baked it direct from the refrigerator. Meanwhile, preheat the oven, with baking stone, to 250 C. I placed the steampan with hot stones at the bottom of the oven. Turn the proofed loaf onto a parchment on a peel. Slash with a cross. Once the loaf is in the oven, turn the heat down to 230 C. Bake for 12 minutes with steam, and another 15 – 18 minutes without steam or as long as you need with your oven. It took me 30 minutes without steam. Leave the oven door cracked open a bit for the last 5 minutes of this time. The crust should be a deep brown. Then turn off the oven and leave the loaves in for 5 minutes longer, with the door ajar, to help them dry. Larger loaves will need to be baked longer. Amazing looking bread! I will have to try this for my wife. Thank you Ian, your wife will love it too! 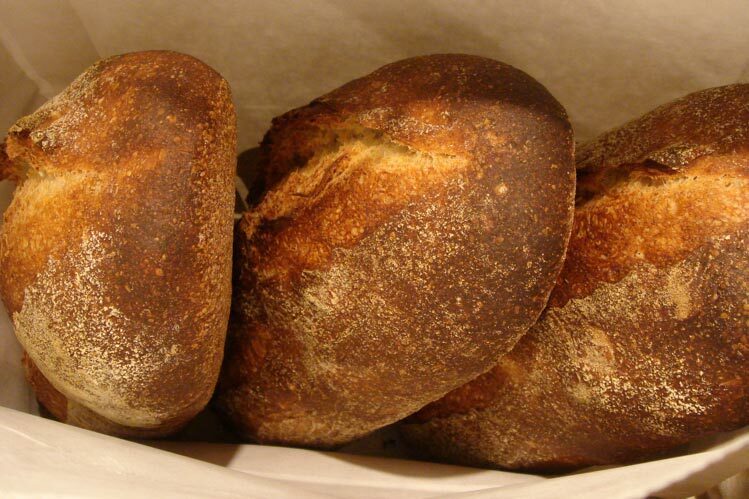 This bread looks delicious and utterly addictive! Just my kind! Thank you farine, it is delicious. Oh my! I am making this very soon... I can just imagine what the house will smell like.